Located at 85' above sea level near Danciger Texas, about 50 miles SW of Houston. 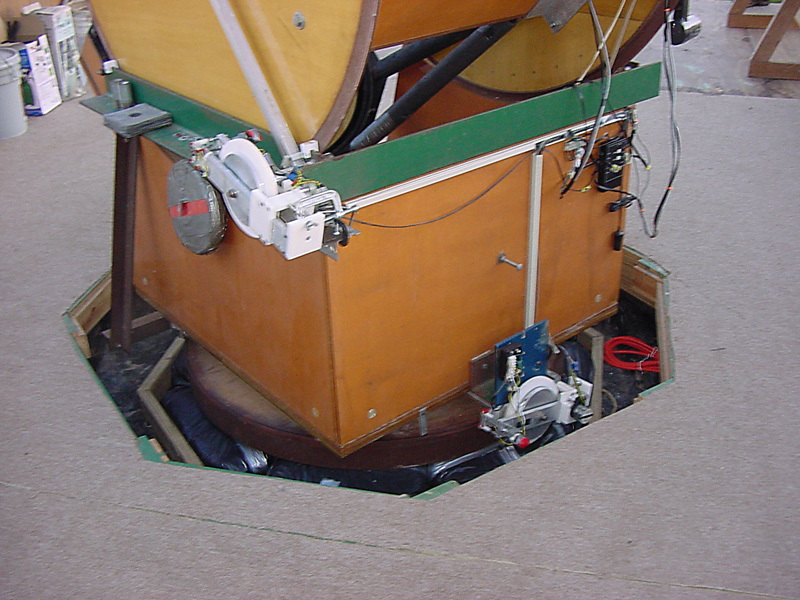 Until September 2006 the primary instrument was a 32" f4 Newtonian telescope with optics by Paul Jones of Star Instruments (Flagstaff). 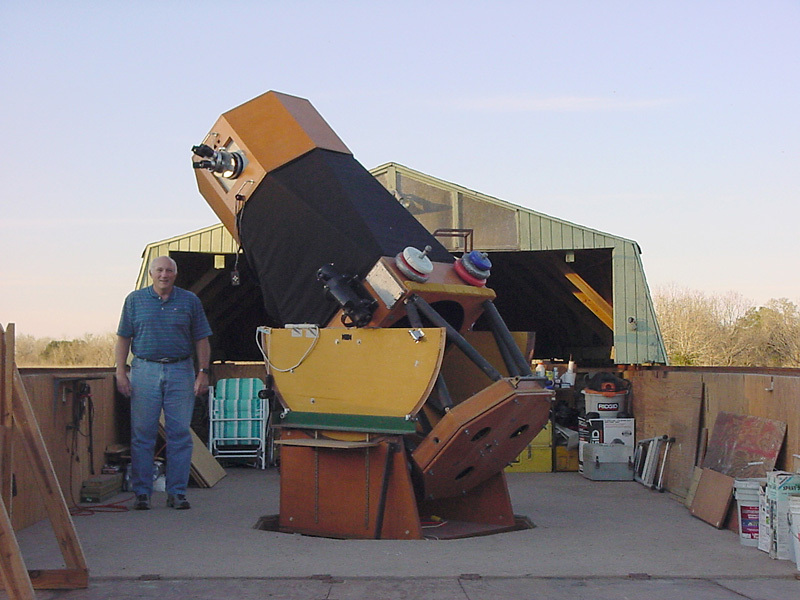 Completed in 1989 (see Dec, 1989 S&T for article describing the scope) and sold in August 2006 to the Alliance for Astronomy, headed by Jim Roe. The scope has now moved to the St Louis area. Original concept by Al Kelly and Andy Saulietis. Overall building and scope design by Andy Saulietis. Financed by Al Kelly, Frank Cooper, Paul Torrance, and donations by observing groups. 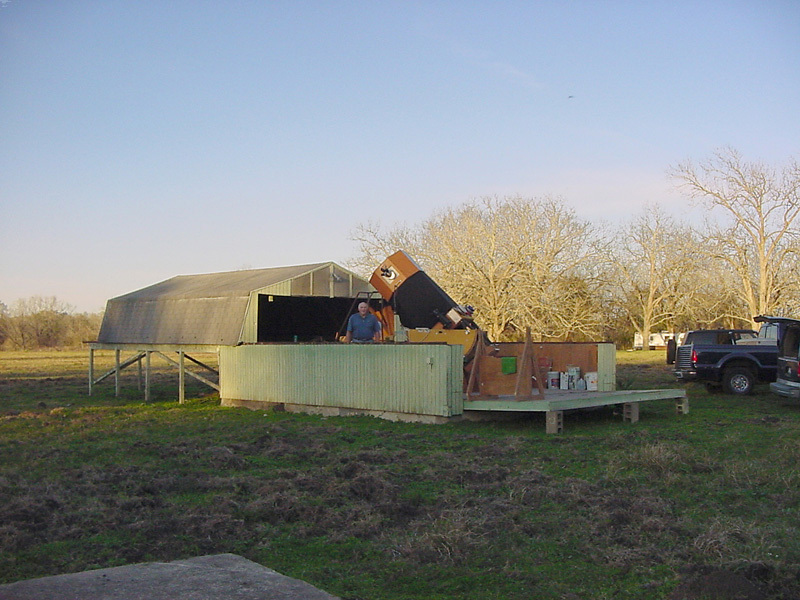 Built by Al Kelly, Andy Saulietis, Frank Cooper, Danny Siner, Chuck Shaw and numerous other Johnson Space Center Astronomical Society (JSCAS) volunteers. At the time of completion it rode on a conical bearing equatorial platform designed by Andy Saulietis and built by Andy and Al (see Dec, 1991 S&T for article on the platform). Currently, the scope is driven by Alt-Az stepper motors controlled by a Tangent Instruments microprocessor. The drives were designed and built by Andy Saulietis, employing HDPE friction gears turned by knurled rollers. Another stepper motor assembly drives the focal plane rotator, also controlled by the Tangent box. 32" f4 Newtonian, operates visually at f4.5 with Paracorr corrrector . Employs 4.25" Newtonian finder, Telrad, and green laser pointer. Double Serrurrier truss OTA. Steel trunnion and Az ring bearing surfaces riding on roller bearings. Ring of triple-wrapped sandbags atop isolated concrete slab for ground support. Total system weight approximately 675 lbs. Designed and built by Andy Saulietis and Danny Siner, altitude and azimuth drives are housed in "tuning fork" clutch assemblies powered by electric motors controlled at the hand paddle. The Hand paddle also allows slow slewing in Alt and Az and is accessible to viewers at the focal plane. The Tangent microprocessor controller uses inputs from optical encoders on the Alt and Az axes to control the speed and direction of stepper motors which drive 1/4" diameter knurled steel roller shafts. These roller shafts drive the clutched HDPE friction gears, which in turn drive the roller bearings which rest against the large Alt trunnions and the large Az ring. For guided imaging, the Tangent microprocessor box accepts ST4- compatible inputs. Designed and built by Andy Saulietis, the turret assembly weighs about 20 lbs. It has a Paracorr imbedded in the base of the turret, just above the 4-position filter wheel. 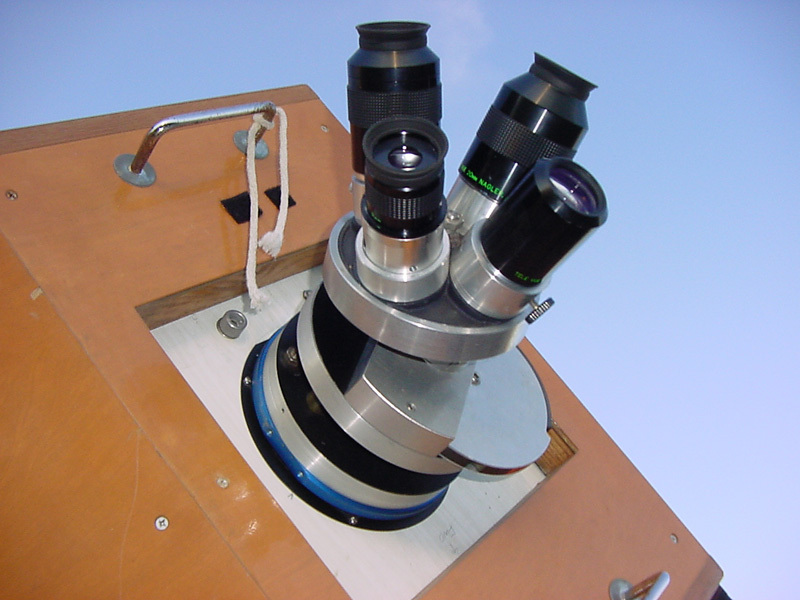 The turret houses Televue eyepieces: 32mm wide field, 20mm Nagler, 13mm Nagler, and 9mm Nagler.